Soup season is officially back, if you ask me. In fact, tonight I made my second pot of soup in less than a week. 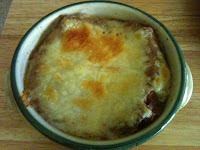 A simple Facebook status update about having just pulled a crock of French onion soup out of the oven led to a request for my recipe, so I figured I should post it on the blog. It's one of those things that people seem to order in restaurants all the time but never make at home. I have to assume that it's because they think it's more complicated than it really is. The secret to this soup is in two of the ingredients. Without these two ingredients, you just have a bowl of beef broth and onions. Add bay leaves and red wine, and you have that familiar flavor you've come to love at restaurants. And while some people swear by a particular kind of onion for this soup, I usually just go with what I have. I'm currently working my way through a 10 lb. bag of delicious candy sweet onions I bought at the local farmers' market, so that's what I used tonight. • In a large pot, melt butter over medium heat. 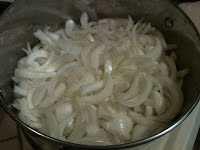 • Add onions to pot. Cook for 30-45 minutes until onions are soft and may be just beginning to brown. • Add broth, wine, thyme, bay leaves, and salt and pepper (I actually use Morton's Nature's Seasons instead of salt and pepper). • Bring almost to a boil, then reduce heat and simmer for 15 minutes. • While soup is simmering, preheat oven to 400 degrees. • Remove bay leaves after simmering soup; discard. • Place oven-safe, individual-serving bowls on a baking sheet. • Place croutons or garlic toasts into each bowl. • Ladle soup into bowls; top with 1 or 2 cheese slices. • Place pan of bowls into the oven; bake until cheese melts. If bowls are broiler-safe and you want to bubble the cheese a bit, you can finish off the soup under the broiler. As I stated on Facebook, I think you were a Chef in a past life!